1 DARK Tuner + 1+ non-Tuner monsters Cannot be destroyed by battle or by card effects. When you take damage from an attack involving this card, or from an opponent’s card effect: This card gains ATK equal to the damage you took. 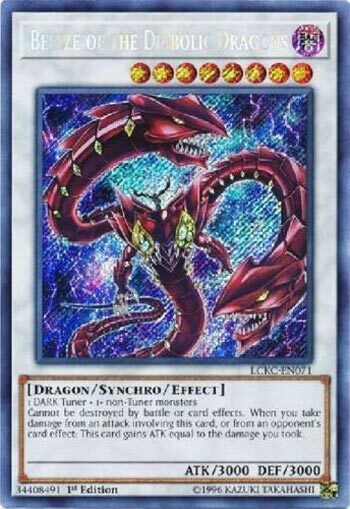 Beelze of the Diabolic Dragons gets another reprint in the Kaiba Legendary Collection, and for good reason, as it is still a great Synchro monster that can swing a duel. A DARK Tuner and one or more monsters (non-Tuner) are easy to come by if you are playing Synchro monsters. Greats stats and support backing it, and even without support behind it, Beelze is amazing. Immunity against destruction of all kinds, ya gotta love that kind of effect. If your opponent can overpower Beelze (3000ATK), Beelze will gain the damage and stack it onto its own attack, ensuring that it will be the one to stand tall next turn. Yes, you can bounce this mighty dragon back with stuff like Castel, and Utopia the Lightning can overpower it, but you’d better be sure it’s a killing blow to the opponent, otherwise Beelze is coming back next turn with 2000 more ATK against your 2500 Lightning. 3000DEF doesn’t get respected enough either. It can be an indestructible wall that your opponent can’t punch through. Sit Beelze in defense mode and you have as sure of a protection as you can have. It being tributed for a Kaiju or a card effect like Stormforth are the few other things threatening this card. It is so good still. If you have a DARK Tuner, you should probably have this guy in your Extra Deck. Beelze of the Diabolic Dragons is a Level 8 Dark Dragon-type Synchro Monster with 3000 Atk and 3000 Def. All of that is great and this card cannot be destroyed by anything. Then if you get attacked or attack something stronger than 3000 you don’t get destroyed and gain the damage as more attack. If you take effect damage from the opponent, you gain that damage as attack as well. Assuming you don’t lose from the damage, this will be the strongest monster on the field and it is immune to destruction. The only downsides for boss monsters are that they can be tributed or removed from the field in other ways. Still, destruction protection is better than no protection. It’s not perfectly generic as an additional downside because it requires a Dark Tuner. Very powerful boss even without the protection. And it looks cool too. We continue this week of Legendary Collection Kaiba cards with a Dragon Synchro that was only printed in the first Premium Gold 4 years ago before now, Beelze of the Diabolic Dragons. Beelze is a Level 8 Dark Dragon Synchro with 3000 ATK and DEF requiring a Dark Tuner and 1+ non-Tuners. ATK and DEF is amazing for a Level 8 Synchro. Dark and Dragon are two good qualities to have when it comes to type and attribute. The summoning condition isn’t too hard considering there are many good Dark Tuner monsters out there. Beelze while on the field cannot be destroyed by battle or card effects. It is literally indestructible. At the time of release, cards like Castel and Ningrisu were not a thing, so the best card to out this was Number 101. Beelze can be hard to get rid of for True Dracos as well, and it will hurt when Master Peace is unaffected by your Dragonic Diagram. If you take damage from a battle involving this card or you take effect damage, this card gains ATK equal to the damage you took. So Beelze can get over stronger monsters, but you got to be willing to take damage first. The effect damage bit is pretty nice as well. Beelze is overall a great Synchro monster and the only thing stopping it from being a 100% staple for any deck that can use a Level 8 Synchro is the Dark Tuner, but that doesn’t stop this card from being great. Art: 4/5 He looks very sick. Beelze of the Diabolic Dragons…a Synchro Monster, eh? Level 8 (good), Dark (good), Dragon (good), 3000 atk (and def, also good) Tuner requirement has to be Dark (not an issue) and then generic, one or more, non-Tuner Monsters. Immunity to destruction by Battle and Card Effect? Gnarly…protection of either sort is good, protection of both sorts is downright amazing. The second effect is very interesting, but only adds to his power. When you take Damage from Battle involving this card (note the phrasing, so you could ram this into something stronger, it doesn’t say you have to be attacked) OR an opponent’s card effect, this card gains an equal amount to its own attack. Getting this guy off the Field won’t be impossible, but it will be difficult. He could be a game finisher if left on the Field for too long…but options involving Tributing could work in your favor. He’s a boss Monster, and not, at the same time.